Can You Use ExtraBucks or Coupons Online at CVS? Can You Use ExtraBucks or Manufacturer Coupons Online at CVS? CVS Online shopping Frequently asked questions. All your CVS online shopping questions answered. 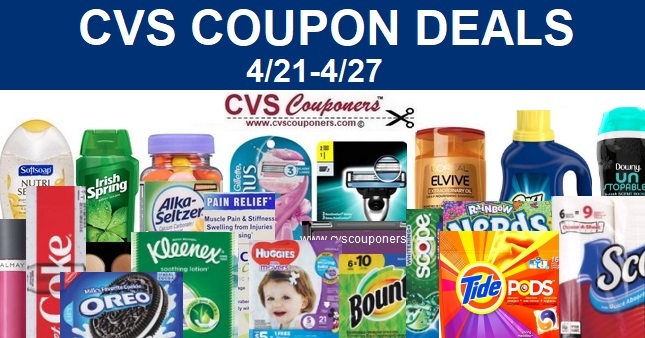 Plus CVS.com Online Coupon Shopping Tips. Exclusive CVS Online Only free $10 Bonus Offer- Limited Time. Shop Online CVS right now and get FREE $10.00 cashback offer on any purchase on cvs.com. CVS Online shopping Frequently asked questions. Q) Can You Use your Extra bucks Online at CVS? A) You can redeem select ExtraBucks Rewards by clicking on the coupon description on the ExtraCare Rewards page to activate it. Apply it to your order by clicking on the “Use Coupons/ExtraCare Rewards” button in your shopping cart. 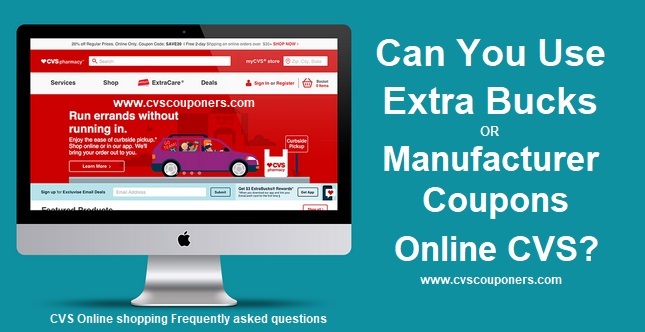 Q) Can You Use Manufacturer Coupons Online at CVS? A) No you can not use printable or insert Manufacturer coupons online at CVS, but you can use coupons attracted to your CVS Extra Care Card, so make sure you load coupons to your CVS App before you shop. 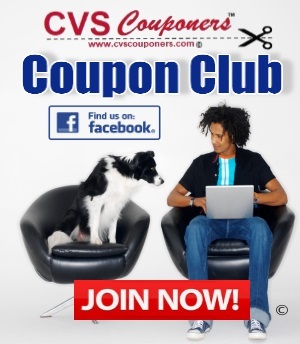 Plus CVS does send out exclusive cvs.com coupons, so make sure you opt in to CVS emails. Q) Does online Extra buck Orders Count before or after coupons? A) The one disadvantage of shopping CVS online, You must still meet the required threshold after all coupons have been applied, unlike when you shop in stores you must meet the required threshold before you can apply coupons. If you need to spend $20 to get $5 extrabucks, then you must spend $20.00 still ....after all coupons have been applied. Here is an example of the same deal done in store, then the same deal done online. Plus you can only use coupons attached to your CVS Extra-care card, no printable or inserts coupons. -must meet or be above threshold $20.00 after coupons have been applied. must meet threshold of $20.00 before coupons have been applied. Q) Does CVS deliver on Sunday or holidays? A) No deliveries on Sunday or USPS holidays. What if i need my items ASAP? A) Thankfully, most stores have a free in-store pickup option. Just click on the handy store locator tool, shop for merchandise labeled with "Pick Up In Store" and wait for a pickup notification. Merchandise will be ready in as little as one hour. No need to Google search a "CVS store near me." Q)Can I use manufacture printable or insert coupons online CVS? Q) Why is the price different online CVS? A) Delivery orders are charged at online prices, which may vary from store prices. Q) Can I order item from target CVS Pharmacy? Q) Oh No!, My order is late? A) Its a busy world out there and drivers work in some very stressful situations, be patient Delivery may be subject to delays in some cases. Orders placed before 4 pm on Friday will be delivered by Monday. Orders placed at or after 4 pm on Friday or before 3 pm on Saturday will be delivered by Tuesday. Orders placed at or after 3 pm on Saturday and all Sunday orders will be delivered by Wednesday. If an order is placed, or if a delivery period falls on a USPS holiday, the delivery time will be extended by additional days, as applicable. Different order cut-off times may apply at some locations. Q) What method of payment can i use to pay online CVS? A) Customer must have a credit/debit card on file and may include FSA/HSA cards. FSA/HSA cards may not be used for delivery fees. Payment must be made at time of order. Q)Can i earn cashback shopping online CVS! Average member earns at least $450 a year! Q) If i get a refund does it go back on my credit card? A) Refunds in connection with delivery orders will be issued on a CVS Money Card, which can only be used at CVS Pharmacy. Q) How will i receive my items from shopping online CVS? A) Courier will deliver package to customer's mailbox, doorstep or other safe place. If none is available, the package will be held at the local post office for up to 15 days. After 15 days, package will be returned to pharmacy and customer must call pharmacy to reschedule delivery (additional delivery fees may apply). Q) Does CVS Health plans members get any type of Bonus! A) In select locations and for some health plans members, delivery fee may be lower. Orders must be placed by 12 pm ET to be delivered in 1–2 business days. Orders placed before 4 pm on Friday will be delivered by Monday. Always check with cvs.com for any changes or updates with online shopping, may be subject to changes without notice.